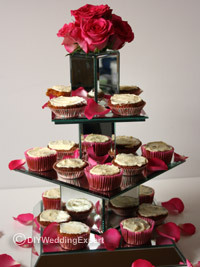 This project will help you create your own special DIY wedding cupcake stand. 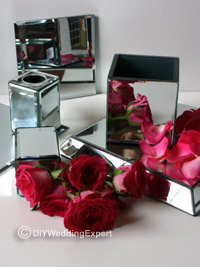 I’ve used squared mirror tiles to create my cupcake stand as they are often easier and cheaper to buy but you could easily make it with circular mirrors. I think by adding the flower topper and rose petals you can link it to your own wedding flower and color theme. Three different sized mirrors I used a 12 inch, 10 inch and 7 inch square mirror. 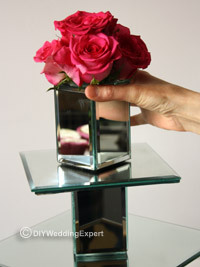 Two mirrored pillars, I used a 5-inch cube mirror vase and a 4-inch tall mirror tea light holder. For the cake stand topper I used another 4-inch tall mirror tea light holder. Flowers to coordinate with your wedding flower theme I used 6 pink roses. 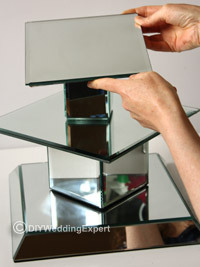 Simply create a tower of mirrors starting at the base using the largest and work your way up to the top tier. 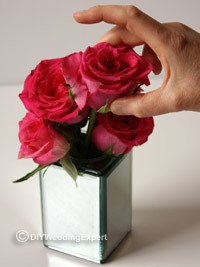 To create the rose cake stand topper I took the metal dish out of my mirrored tea light holder leaving a hole to place my roses. Place 5 roses into the center. Place on the top tier of your cake stand. Arrange your cupcakes onto the stand. Take the sixth rose and gently break off the petals. Scatter them randomly all over the stand and onto the cake table. 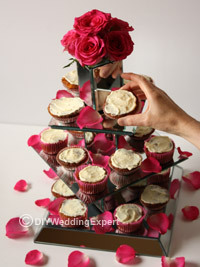 It’s that easy to create your own DIY wedding cupcake stand. 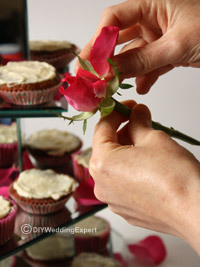 Learn to make your own DIY wedding cupcakes.